Sometimes after dinner on summer evenings, when the days stretched into 9 pm, mom and dad would herd us kids into the burgundy-colored station wagon and we’d drive the 15 miles or so over to Mentor and what passed in those days for a mall. Malls were special places back then. Rarities. Imagine: people actually enjoyed spending time in them. We’d walk past the shops, but rarely went into them. We weren’t there to shop. It was all about dessert. We were there for either Baskin-Robbins or Orange Julius, both of which were tucked away in one of those “side streets” that malls have; the dead ends and backwaters. Where the neglected step-children of the “anchor” stores were. Do you remember Orange Julius? The chemists there concocted bright orange drinks that had the after taste of St. Joseph’s Aspirin for Children – a taste, I confess – that I loved. Maybe it was supposed to be vanilla, maybe malt. I have no idea what was in the powder they added to the orange-flavored beverage, but whatever it was, it sure tasted good. I’d bet that if I sipped an Orange Julius today, I would find it overly sweet and about as close to tasting like an orange as a green apple Jolly Rancher candy tastes like a fresh Granny Smith. My version of the Orange Julius is the real deal: real orange, real vanilla and a healthy pile of spinach to help us get our daily dose of green. No funky powder. 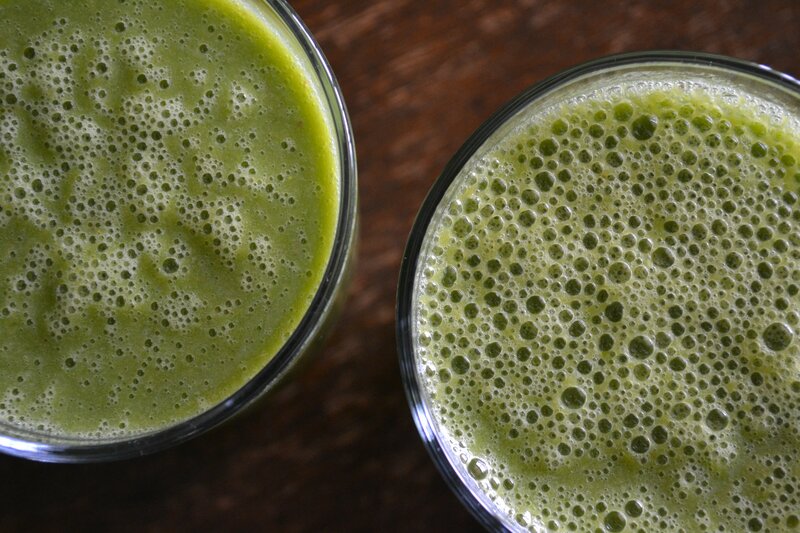 By the way, you’ll probably be seeing a lot of smoothie recipes coming down the pike. I’m working my new Vitamix like crazy. My version of the Orange Julius is the real deal: real orange, real vanilla and a healthy pile of spinach to help you get your daily dose of phytonutrients. No funky powder. Place the ingredients in a good blender or Vitamix in the order shown. If using a Vitamix, start on Variable 1 and turn to 10 (of if you are a Spinal Tap fan, crank it to 11 to get that extra little oomph) and then flip the switch up to High. Let it process for 30-45 seconds. Serve pronto. Writing up my potluck post as we speak my friend! Can’t wait to see what you bring – oh, how I wish I could sample it as well!! my vitamix is my favorite thing that I own! “Don’t buy me diamonds and pearls.. I just want a Vitamix” LOL — yeah, no. I’m not getting one. Trish, my husband about fell over when he saw the price of one…A blender at Walmart is $20 – so he was thinking along those lines. But, now that we have one, he “gets” it. And he LOVES the daily smoothies. Can’t wait to try this. I have a juicer and a blender and I’m collecting recipes! I’m juice/smoothie crazy right now – and also collecting recipes! I used to looove Orange Julius when I was a kid! Didn’t they have raw egg in them? Maybe that was an urban legend. Anyhoo, yours looks delicious and much healthier! Gosh, Barb, you might be right! Or at least, that’s what I remember hearing as well. Forgot about that until you said it – yuck!! HAHA – oh so funny! Now I want to watch it again! Thanks for the recipe – I’ll definitely try this. I used to love Orange Julius as a kid too, but haven’t had one in many years. Agree with Barb – I remember the raw egg craze and think that Orange Julius did this, at least temporarily. One of the things that really struck me about Orange Julius was that the entire orange was dropped into the blender, peel and all. I thought that was so weird and expected the pith, peel, and seeds to make it sour. It sure wasn’t though! Now I cook whole citrus in a pressure cooker then pop them into a food processor to make orange or lemon sauce. 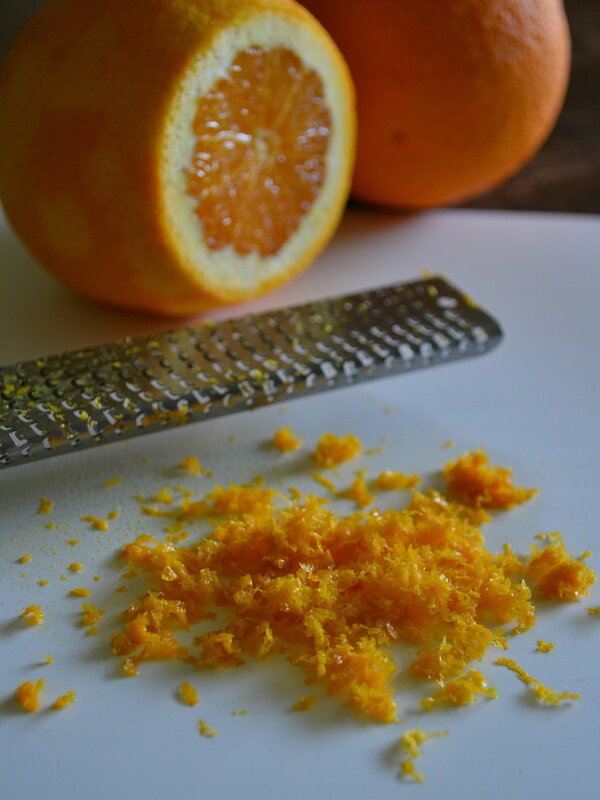 Once cooked the citrus loses its sour flavor and becomes nice and mellow. Yum. I remember those days too when malls were a new thing. Back then it was just “an indoor shopping center,” a novel experience. We didn’t spend any more time in them than we did, say, the shopping center on the corner with the grocery store. Our American mall rat subculture, use of malls as an entertainment destination, and tendency towards extreme overconsumption hadn’t kicked in yet. These days I enjoy shopping in outdoor market stalls or private shops – local vendors producing locally made goods. A big 180 from the malls we grew up with. I vaguely remember the whole orange going in – actually pretty amazing. The pressure cooker/processor sauce sounds wonderful! Reminds me a bit of preserved lemons somehow, but a whole lot faster! And I completely agree! I’d much rather buy from a local purveyor, browse a used book store or grab ingredients for lunch at a farmer’s market. Let’s hope those things don’t disappear from the retail landscape! Haha! I’m a Cleveland girl, so HAD to go with Vitamix! But I’m also a Libertarian, so, live and let live with the Blendtecs ;-)! Ron Paul? Literally drinking the real orange julius now. Wowza! What a nice change from my normal breakfast green smoothie!!! I added half a frozen banana cause that’s how I roll. SOOO GOOD ANNIE! I love the bubbles, they make it taste extra special, it looks fantastic! I’m getting quite excited about the VVP, roll on tomorrow! The bubbles DO make it extra good! It’s going to be so fun to see what our creative minds have concocted, don’t you think? We’re all going to need a couple of weeks off of blogging just to make the recipes! I agree, and I was thinking that a lot of people are going to be spending a lot more time than usual reading blogs tomorrow! I admit, I too LOVED the orange julius flavor. I haven’t had one in years..but I know that anything that replicates it (and is healthier) would be a staple in my diet!! I will be trying this recipe in my Blendtec ASAP! What was that flavor?! My memory says this smoothie is close, but who knows! Oh no, my potluck post just posted, I deleted it and restored it into my dashboard, I guess I was incorrect with my 24 hour clock when I scheduled the post. My heart just dropped, but I think I have it fixed. Grrr! WP scheduling is really funky! I’m nervous mine is going to go haywire, too! Other folks have had theirs post prematurely, too – no worries! Whew….I had a minute of sheer panic, but thanks for reassuring me! I loved Orange Julius! When I was in high school, it was the cool thing to do to go out for lunch at the mall if you had a car- so all of us would pack into my one friends car and go to the Orange Julius. I probably gave them so much of my money! Haven’t been in years (doesn’t really fit in with my current lifestyle ya know 😉 ) but I think your version would be a lovely throwback! Anne, I’m infatuated with it! I can’t wait to have my blender so I can try this. YUM. GORGEOUS smoothie, Ann! Making my mouth water all the time, as usual! What type of almond milk do you use? Is it also raw? I wish it were homemade, but alas, it’s unsweetened Silk. It would be SO much better with the homemade stuff – just need to find the time to make it. Sigh! Ann you won’t believe how FAST it is to make!!! Give it a try! And please do let me know the results! Yum! Healthy too, I don’t think I have ever said that about an Orange Julius! What a divine smoothy! I can’t wait to try it out with my own vitamix! Yeah!!! Yum. I have a nutribullet, and have become a smoothie fanatic. Thanks for the recipe!